Two seal pups died in separate incidents recently after humans—no doubt well-meaning individuals!—attempted to help them, thinking they were abandoned or distressed. Say it with me now, slowly and loudly: Stop trying to rescue wild animals by yourself. 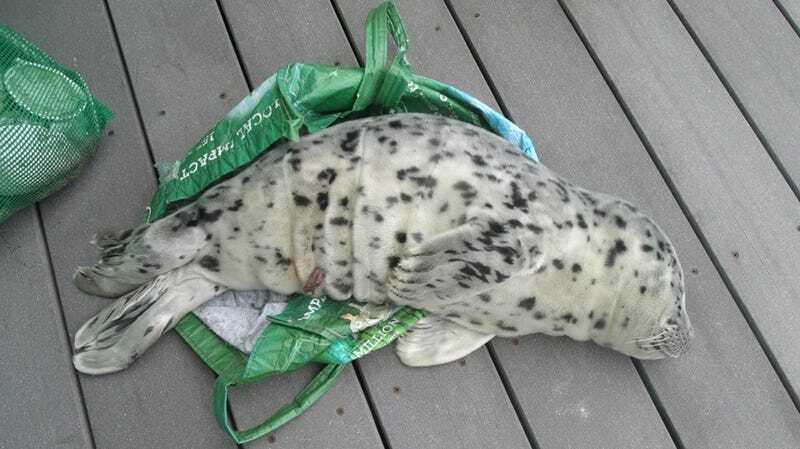 In one case, a woman picked up a harbor seal pup on a beach near Westport, Washington. Thinking it had been abandoned, she put it in a recyclable grocery bag and whisked it away. Though officials initially wanted to release the seal pup back where it was found, it was too late. It was “unfortunately so unresponsive, and so much time had gone by” that it was euthanized, Myrsell said. In a separate incident, a couple came across a seal pup on a beach in Oregon. Thinking it had been abandoned, they wrapped it in a towel and brought it home, where they put it in the shower. Officials later returned the little seal pup to the beach, but it was found dead one day later. A recent wave of these “rescues” has even prompted NOAA to put out an advisory this week warning people against interfering with the local wildlife. Unfortunately, seal pups aren’t the only ones at risk for human interference. In May, a bison calf at Yellowstone National Park was euthanized after tourists put it in the back of their SUV. It was subsequently abandoned by its herd and began “causing a dangerous situation by continually approaching people and cars along the roadway,” according to the National Park Service. Although these people—or at least the people involved in the aforementioned incidents—were likely just trying to help, it’s generally not advisable to handle any wild animal, no matter how distressed it looks. For marine mammals, NOAA suggests calling in the experts, and that’s generally a good idea for other kinds of wild creatures, too.